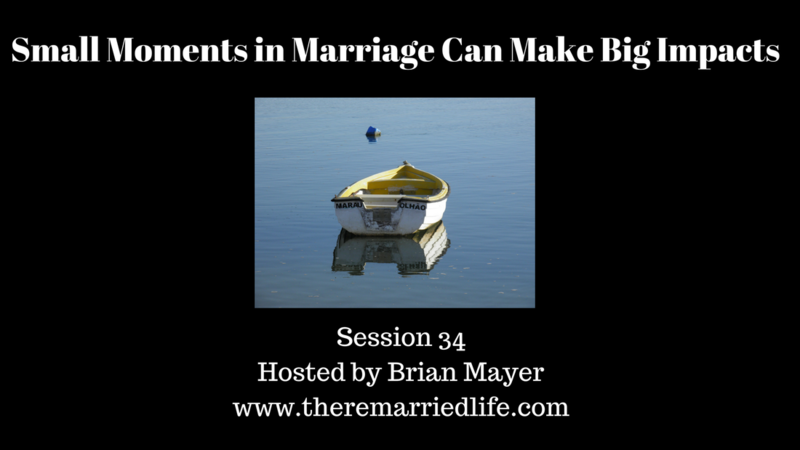 The moments in a marriage that can make it or break it are the small moments of connections and not the grand shows like a wedding, vacations, or big purchases, I would argue. The moments we are referring to are small things like, “how was your lunch today” or “did you see the massive downtown fire on the news today” or “did you notice our daughter has been smiling more lately?” These are not just simply questions, but again are something much deeper. These are referred to as bids for emotional connection or emotional attachment. There have been lots of studies of this attachment idea and that the way in which we attempt to attach to our current partner is complex. It often is a result of how attachment by our caregiver went when we were young. Did they anxious cling to you, did they avoid you, did they dismiss you, or did they provide the right balance of love and boundaries. How we make or respond to bids can also be impacted by our previous marriage or other relationships. It can also be impacted by our current relationship. Are we encouraged, ignored, or belittled when we make attempts to connect with our partner. Responding to one bid in a certain way will not make or break your relationship usually unless a bid is met with abuse. In general, it is how over time the responses to these bids go that will determine the relationship outcome. Let’s think about this in terms of your work environment. You ask questions of people on your team and over time if you are met with disdain or are ignored, what will you do? Eventually you will stop coming to that source and move on to someone that responds in a more positive manner to your questions. Same in a marriage relationship! Lets’s talk about the ways in which we can respond to these emotional bids from our partner. These responses are based on the work and research of John Gottman who has worked with couples for more than 40 years. Turning Toward – This can be as simple as acknowledging the request with a “Yes.” Of course remembering that body language and tone are important, but the words don’t have to be grand or verbose. Turning Enthusiastically Toward – this is a step beyond Turning Toward. For example, if your partners asks how you dealt with the drive through the snow this morning, you might respond by saying “Wow it was unbelievable, lots of slow movement, several wrecks. I felt really bad for many of the drivers. How did you do this morning, honey?” See how that is different. It shows your partner that what they have said is important and that you care about what they say. Turning Away – Just like Turning Toward can be simple, so can this one. Only this one is on the negative end of the spectrum. The most basic example of turning away would be to simply ignore what your partner is saying or sometimes a “huh? as you or they look up from their phone” It basically says, what you say is not terribly important and I don’t want to invest the time in what you have to say. Turning Against - This is the worst form of responding to a bid for connection. Not only do you not really care what your partner is saying, but you proceed to attack them for asking or bringing up something up. It might go something like this. “Hey Honey did you see the awful earthquake on the news today?” A Turning Against response might be something like, “No, I don’t watch the news and I really have no idea why you do either. There are plenty of other more productive ways you should be spending your time.” Ouch this one hurts. A few of these, and a total shutdown and wall will soon be built. Responding to Bids is not rocket science. However, as mentioned previously relationships won’t turn on a few of things but if you are patient and persistent then you should see the ship start to turn. Some caveats to mention that make the ship turning more difficult include alcohol or substance abuse, a current infidelity, untreated mental health issues, or current abuse. These issues will slow and even stall the impact especially of the more positive turns. So focusing on these issues are also important. ​Your challenge for toward is start Turning Toward much more often than Turning Away.